Please download the app named "iUSB " from app store. If iOS device pops up a message said "this accessory is not optimized for this phone", just disconnect and reconnect again. 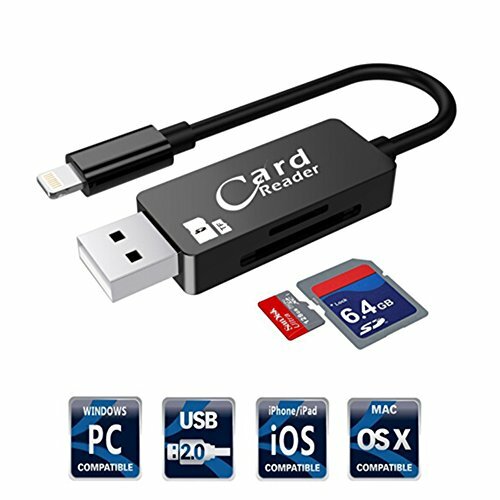 PRACTICAL AND MULTIFUNCTIONAL: It's a USB Card Reader for universal PC and Laptops, a USB Type-C Card Reader for OTG Supported phones/tablets and laptops with type c connector, and a USB Type C Cable for Charging and Syncing. USB C CHARGING CABLE 5V/2.0A:When you using it as charging cable, it supports a Max current of 5V/2.0A power to charge your phone at rapid speed.It is convenient for travel. PROFESSIONAL SECURITY APP:Free App [ IUSB ] from App Store for communication, you can transfer any data and files between your Devices and IUSB HD Card Reader,View trail camera photos on your phone. SHARE PHOTOS/FILES ANY TIME:While in travelling, you can send the photos that you took with camera via card reader from SD card to your cell phone, and share the beautiful moments of your journey with your best friends or family. If you have any questions about this product by Gufee, contact us by completing and submitting the form below. If you are looking for a specif part number, please include it with your message.